This article was inspired by my need to make a reliable ignition box that would fire my 1911 Gray 1 cylinder, 2-cycle , marine engine. The design is not new – simply put, it was how I did it with the tools and materials at hand. I wanted to make sure that whatever I made, was reliable, since about 80% of problems with old engines are electrical, even though the electrical system is a very model of simplicity. The parts I used for the critical bits, were from modern ignition systems – a 12 v ignition coil, and a set of points from a lawn mower engine that had died. The 12 v ignition coil was “recycled” from the local dump and was rescued off a worn out outboard motor. Actually, it was a 2 cylinder, so I got 2 coils. The key thing to understand about this ignition box is that it is part electrical and part mechanical. Both parts have to work properly for the spark to be reliable. There’s a diagrammatic layout of my ignition box. The dashed lines are the low voltage connections. 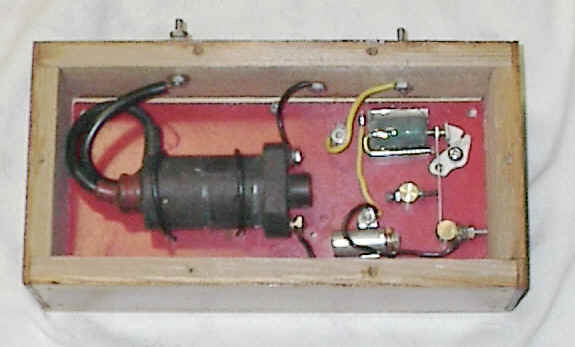 The box was designed to operate satisfactorily on a 6 v dc dry cell. The heavy black line from the 12 v ignition coil is the high voltage wire. Essentially what happens is that the points are closed when the 6V is applied to the primary circuit. This causes a flow of current through the buzz coil, creating a magnetic field. This magnetic field attracts the spring arm of the points, causing the points to open. The current stops flowing, the magnetic field in the buzz coil stops, the spring on the arm of the points (mechanically) causes the points to close. When the points close, it causes a current to flow etc etc and repeats . . and . . . buzzes. It is the interruptions in the current flow, that induces the high voltage from the primary winding of the 12 v ignition coil to the high voltage secondary winding . I get open air arcs at least 3/8 in long. When connected to a spark plug with a .035 gap, there is a bright blue fire. WATCH OUT though – the high voltage from this box will give you a really good sting if you touch it. – You’ve been warned! The buzz coil is about 1½ in. long and has about 300 turns of No. 20 wire (enamel insulation). The heavy line is a 3/16 dia. steel U shape, so that I , in effect , have a horseshoe electromagnet when the current is flowing though the coil. The U shaped steel piece helps confine and concentrate the magnetic field so here is a strong pull on the spring arm of the points.. 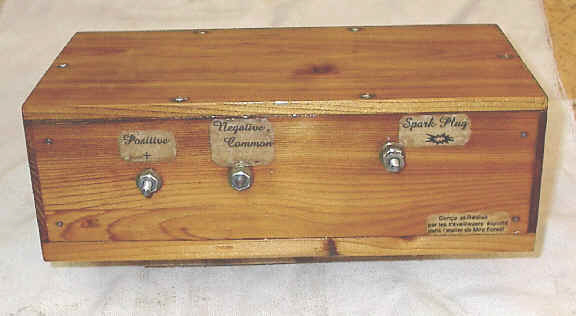 The buzz coil is epoxied to a bed ( an aluminum half round channel) which is itself held to the base with a small bolt. The base is a sheet of 1/16 in thick stiff plastic sheet. The pressure adjuster is a brass ( non-magnetic) post, threaded to hold a 10 x 32 screw and a lock nut, which allows the pressure on the points to be “tuned”. The points ( from the old lawn mower engine) consisted of the stationary part and a spring mounted part. I straightened the spring, but I found that the arm was too long and like any pendulum, vibrated at too low a frequency. The pressure adjuster shortens the pendulum arm, and makes the points vibrate at a higher frequency . The sound the buzzing makes is about Middle C ( 440 cps). With the longer pendulum arm, the frequency was much lower and the contact was less reliable ( less mechanical pressure ). I found that the system worked much better when I added the capacitor connected across the points. The capacitor was from the same dead lawn mower engine. As for tuning the thing, I found that there was a sort of optimum pressure of the adjuster which could be determined by measuring the current ( about 275 - 300 mA), listening to the buzzing, and listening to the noise that the spark made jumping across the gap in the spark plug. You’ll see, hear and feel the variation. One you have the optimum point, you lock down the pressure adjuster’s lock nut. I then made a cedar wooden box for the guts, connected the 6V wiring and the high voltage to small bolts that allow connections to the outside battery and plug, varnished the box and , voila – an ignition box for my Gray engine !